From the publisher: The odds had always been stacked against Homer, the blind kitten nobody wanted. But destiny took a hand the day he met Gwen Cooper, and with the publication twelve years later of the international bestseller "Homer’s Odyssey," Homer went from beloved house cat to world-wide star. He became the scourge and darling of the reporters, photographers, videographers, bloggers, and radio hosts who clamored to meet him—dragging his hapless human behind him as he greeted fame with his usual joie de vivre and occasional “catitude.” He became a spokes-cat for the cause of special-needs animals everywhere, and eventually the wise older mentor to the new special-needs kitten who would enter his and Gwen’s lives. Most importantly, Homer taught those who loved him best how to live and die with courage and joy—and left behind a rescue community of “Homer’s Heroes” that continues to save countless lives in his name. 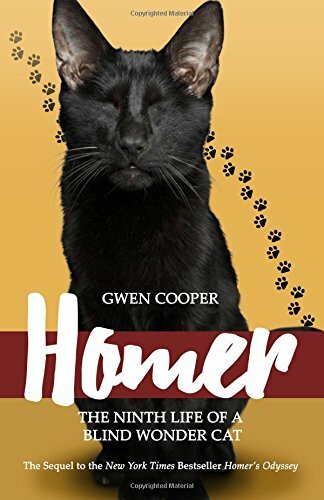 By turns humorous and tender, this beautifully written, 115-page sequel concludes the adventures of Homer the Blind Wonder Cat—the fearless feline who proved that love isn’t something you see with your eyes, that even the smallest of creatures can make a big difference, and that true love lives forever. Anyone who's read Homer's Odyssey knows that it's a story that stays with you long after that final turn of the page. 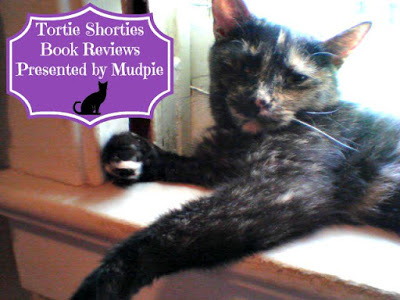 The long awaited sequel, Homer: The Ninth Life of a Blind Wonder Cat, which takes readers through the final four years of his life, is even more unforgettable...if that's possible. Gwen put off writing this book for a long time because she didn't want to relive the pain of losing him. Instead, she discovered that “in writing the book, I’ve gotten to live with Homer again.” What pet owner wouldn't cherish the opportunity to do that with a beloved companion? This sequel covers the trials and tribulations that Gwen faced leading to the book's publication, followed by her awe and amazement as Homer's star continued to rise. She loses the two cats that Homer grew up with, Scarlett and Vashti, leading her to adopt kittens Clayton and Fanny as new companions for Homer. Clayton in particular has a special connection with Homer and ends up playing a large part in Gwen's healing process when she finally has no choice but to say good-bye. Homer passed away on August 21, 2013, the day after I adopted Truffles. I remember reading the news on Facebook and while experiencing such joy with the new addition to my family, also feeling such heartbreak for Gwen, knowing what she was going through having just lost Tara 7 weeks prior. It's the inevitable outcome we all know will happen one day (some much sooner than we ever thought possible, as I discovered with Truffles), yet life without our furry soul mates is just unthinkable. The connection that Homer and Gwen shared is nothing short of magical and that kind of love never fades away. Homer is a hero in my eyes. His bravery in the face of adversity, his joyful outlook on life, his valiant battle to live when medical science said he shouldn't, and his lasting legacy that will continue to help special needs cats for years and years to come. He will live forever in the hearts of those who knew and loved him...both in person and through the pages of a book. We have heard of Homer, but not read the book. Now it sounds like we have 2 books to put on our list! I'm so glad you enjoyed it. Homer's legions of fans will not be disappointed. I read the sequel and loved it (review coming soon). Wonderful review. Home was a celebrity before there were feline celebrities, and for all the right reasons. The mom hasn't read the first Homer book yet though it's sitting on her bookshelf. She better get reading! I can't believe I haven't read the first book in this series yet. Homer's story sounds so special. Thank you for sharing! Purrs! I really want to read this! You are so lucky you received an advanced copy! Homer died 9 days after Abby. I didn't remember when he went, but I was knew he did. I understand how hard it was as we all do when each of us loses a beloved family member. You wrote a very wonderful review. I'm sure I'll read the sequel because I loved the first one so much. Truly, Homer's first book is one of the best I've ever read! It sounds like a fantastic book. Gwen sharing Homer with all of us has been such a gift. Mom doesn't read many books but these sound wonderful. We followed Homer on Facebook. I loved the first one but TW wonders if this will be too sad. I am definitely going to read this. We LOVED Homer, and love Miss Gwen, too. Mommy has met her several times. We can't wait for her to read us this story. We are going to have to get both of these books. Thanks for recommending them.